Another great review for our best-selling model, LiteBelt 100, by “Practical Travel Gear” travel writer and editor Amy Whitley . For the full article click the link below. “As a runner, hiker, and backcountry skier, I’ve tried out several styles of safety lights for outdoor pursuits. For around-the-camp activities, I’ve fallen in love with my head lamp, but a beam that will bounce around while I run or ski just won’t do. Enter GoMotion LiteBelt 100. When I first saw the GoMotion LiteBelt, I was skeptical. Surely a waist belt, fanny pack-style pockets, and duel lights (one LED beam, one flashing safety light) was overkill. But then again, I’d tried all the clip-style LEDs out there, and one by one they had fallen off, dimmed, or just stopped working. I worried that the LiteBelt would feel too heavy or bulky, even though the construction was lightweight mesh. Then I strapped it on for my first pre-dawn run. This light is so comfortable! I would never have believed it to look at it, but I truly forget I have it on. The waist belt does not have to be buckled tightly to feel snug, and the beam does not bounce around as I thought it would. 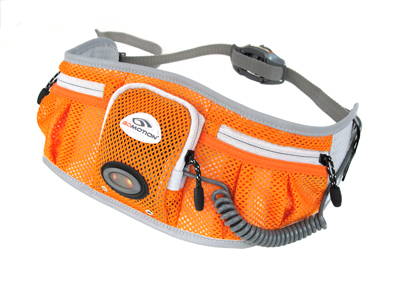 The belt sits comfortably below my waist, and the reflective orange hex mesh is as breathable and lightweight as GoMotion promises. ← Runner’s World Reviews LiteBelt 100!